The AR is one of America’s favorite sporting guns and though the AR means “ArmaLite” (a weapon manufacturer), the AR might as well stand for “America’s Rifle”. Unlike their counterparts, AR-10 began its second life as an extremely successful .308 sporting rifle, specifically intended for those AR-platform enthusiasts wanting that long reach and that more powerful punch than the .223/5.56 NATO in the standard AR-15. In this review, we’ll be covering some of the top charging handles for the AR-10. We have some great models we can’t wait to show you, so let’s get started! The charging-cocking handle, as it name says, charges or loads the rifle, making it a vitally important part. A charging handle helps feed the first round from the magazine when the shooter pulls the bolt (the bolt and bolt carrier in AR case) to the rear enabling cocking the hammer by moving it in the ready position. It also ejects unfired rounds from the chamber and ensures that there are no malfunctions such as jamming, double feed, or misfires. In firearms equipped with a particularly desirable function, known as a last-round-hold-open feature, a bolt is locked to the rear after firing the last round. But when the charging handle releases it, we insert a fresh magazine into the gun and press the bolt release lever. Therefore, a cocking handle is not just an unremarkable slender, rod-shaped object, but this long piece of T-shaped metal is one of the most important AR rifle parts that help you in extremely critical situations. The charging handles can be reciprocating or non-reciprocating. Unlike the AK-pattern rifles, FALs and SCARs, as well as AR-10/15s feature non-reciprocating charging handle (NRCH) with all the advantages and disadvantages. Is the Charging Handle the Same on an AR-10 as it is on an AR-15? While the both AR-15 and AR-10 have a lot of interchangeable parts, the charging handles are specifically built for .223/5.56 and .308, so these parts are non-compatible between the AR-15 and AR-10. Since the modern AR-10s are all really just scaled up versions of the AR-15’s, the AR patterned .308 charging handles have the same shape but are longer than its smaller counterpart (the AR15 / M16 / M4). For instance, a Genuine Armalite AR-10 charging handle measures out at exactly 8" tip-to-tip compared to the BCM Gunfighter 5.56 CH, which measures out at 6 13/16" long. Aside AR-15 and AR-10 specificity, there are also differences inside .308 AR based platforms, such as the “Armalite-style” and the latter “DPMS-style” charging handle. So today, we have two primary options with several variations. 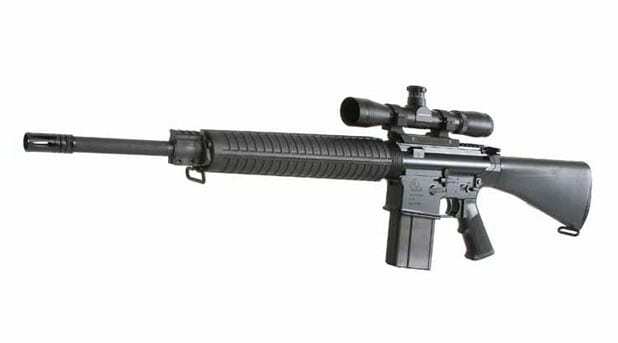 Many of which do not share the interchangeability part that you see with the AR-15 platform, because the AR-10 has never passed through the standardization of parts that the AR15 / M16 / M4 has received. 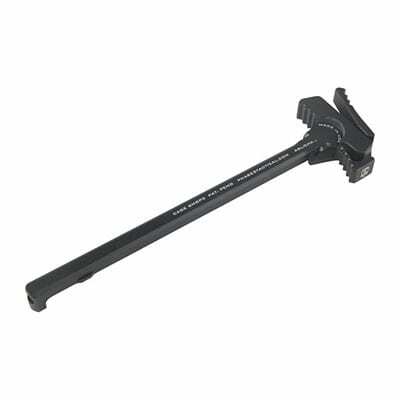 You should also know that durability of stock charging handle is good for casual shooting and for practice at the local firing range. On the other side, higher volume shooters and tactical operators found that basic Mil-Spec handle may not meet the challenge. There are a few reasons for this. First, a standard OEM charging handle that comes with your rifle is without a doubt intended for the right-handed shooters and designed to use with the left hand acting in a support role. In addition, you can upgrade a Mil-Spec handle with an ambidextrous charging handle, offering more benefits for both left and right-handed shooters due to the release lever, placed on both sides of the T.
Furthermore, the top-mounted rifle scopes are liable to obstruct the motion of your hand, meaning you may have difficulties to reach charging handle while using a scope. In addition, the factory charging handle often precludes attachment of most cheek rest types without stock modifications. Another flaw can be connected with current charging techniques implying that operators do that with one swift and strong movement using the support side hand only. 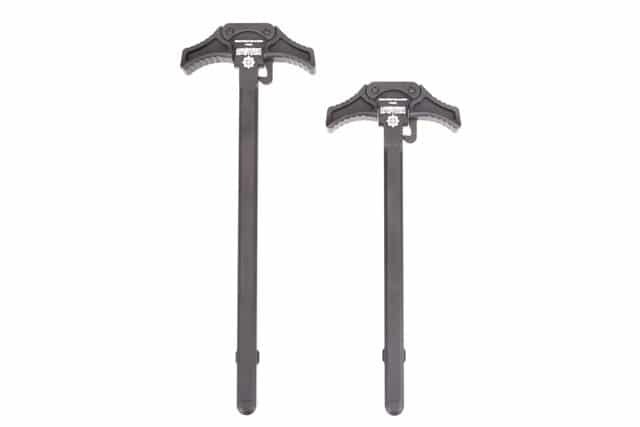 Extended AR charging handles featuring an enlarged extended latch are often preferred for use as a tactical cocking handle. The larger surface area of the extended handle allows the operator to engage the charging handle with a gloved hand, or even to charge by foot if he is arm wounded. Fortunately, the modular design of the AR-15 simplifies the task of replacing parts that enables you to upgrade a standard right-handed charging handle with improved aftermarket component. This features better size, angle, texture, and shape of the bolt latch itself. There are plenty of good reasons to alter the stock charging handle. Upgraded handles are much sturdier and with a bigger grooved latch enabling you to easier cycle the one-handed bolt without binding it. On top of that, if you’re getting blowback through the charging handle like on AR's chambered in pistol or rimfire calibers, or if you are running a suppressor, there are specifically made charging handles with a ridge towards the back which act as a 'gas buster' to safely manage that inconvenience. We completely agree that mastering how to use the charging handle is essential in operating your AR 308 rifle. However, upgrading your charging handle will improve your rifle's performance, so we are offering the summary reviews of two of the best AR-10 charging handle currently on the market. Now we’re going to switch gears and take a look at some of the top charging handles that made our list. Here, we’ll be taking a look at each product’s main features, then covering their pros and cons. 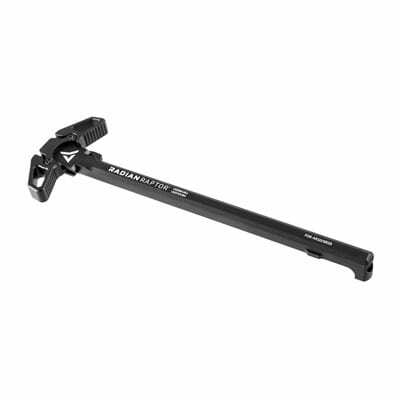 One of the best ambidextrous charging handles comes from Radian Weapons Company (formerly AXTS Weapons System). Unlike its counterparts right-handed models with a lever that extends to the right side, the Raptor is constructed with double, heavy-duty serrated latches on either side of the handle, secured with the heavy-duty axis pins. Moreover, Radian CH and latches are machined from 7075 aluminum, which is 70 percent stronger than the 6061 aluminum. However, it also increases the handle`s price compared to competitions. As we know, AR-10 function with more powerful ammunition, demanding more solid components capable of harsh treatment and manipulation. The Radian Raptor is somewhat bigger than an original charging handle, but it features smoothly machined edges that reduce snags, and are easy on your hands. This CH gives AR-10 owners ability to mount rifle scopes low and back on the receiver. The Raptor ambidextrous charging handle is wide enough to allow you to perform a rapid palm blading, or finger thumb charges of the weapon like a true operator. The extended charging handles sports two identical independent release levers, offering lots of space to grip even when your hands are wet or when wearing gloves. Overall, the ambidextrous design of the Radian Raptor charging handle provides a much more solid grip than a standard charging handle paired with a complete functionality on either side with twin latches. Since the AR-10`s parts are not interchangeable between brands, you should check whether you have the correct rifle for this product. The oversized, ambidextrous charging handles are a response to increasing criticism on stock MIL-SPEC charging handles, as very inadequate for today’s AR’s. Phase 5 machined their Tactical charging handle from 6061 T6 hard anodized aluminum. That charging handle assembly combination with ambidextrous battle latch, features a true ambidexterity ideal for left-handed users of the AR-10 platform. A Phase 5 Tactical has an unusual design, consisting of a large, oversized lever that extends to the right side of the latch which allows left-handed shooters to charge the weapon with their right hand. As an added bonus, much wider and extended levers help to clear the blockage and jams especially in the dark, or while on the move and with gloves on. Phase 5 also integrated aggressive serrations located on the right side of the handle and oversized grooves on the battle latch for solid, non-slip grip. The Phase 5 improved AMBI Charging Handle Assembly features a construction that is more rugged with its increased sidewall thickness and upgraded stainless coiled spring pin with an enlarged diameter, now measuring .1875-inch. The Tactical .308 Phase 5 charging handle is specifically developed to be compatible with all .308 DPMS Gen 1 type platforms, but you can encounter problems if you use Magpul PRS stock since it’s cheek pad may obstruct the charging handle from fully cycling. Due to the extended length of the latch, it may be easily caught in other rifle parts or operators gear and broken off in these situations. Many AR aficionados like look and style of the Phase 5 Tactical .308 AR charging handle, with its right side pull latch and the lefty push in the lever, basically duplicates the grabbing surface areas of OEM charging handles. However, the main advantage of upgrading the charging handles lies in the fact that they are relatively affordable, and one of the easiest parts to replace, this can be done during a common cleaning procedure. Although disassembling and cleaning an AR is different than most traditional hunting rifles, the first step is the same: safety. With rifle barrel pointed in a safe direction, remove the magazine, retract and lock the bolt to the rear while visually inspecting the chamber. Remove any ammunition that may not have been ejected. Then release the bolt. The following step means that you have to separate the upper from the lower receiver by pressing the rear takedown pin from left to right, as well as the one in the front. This is called the pivot pin. This will allow you to hinge the upper receiver, forward and up, and separate it from the lower receiver. 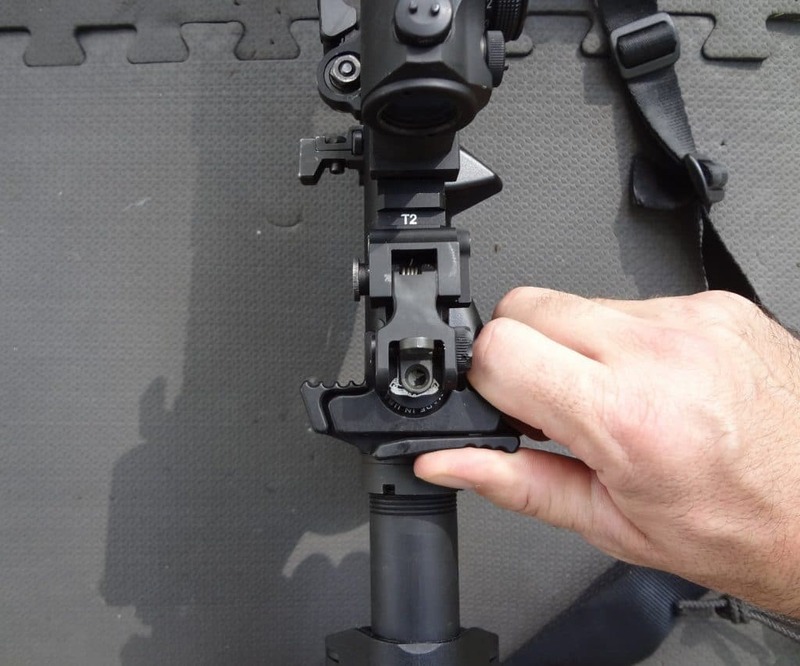 Now, slide the charging handle to the rear while pressing downwards; it will release from the upper and slide back together with a bolt carrier group. Instead of inserting the OEM charging handle, you should insert a new charging handle of your choice accompanied with BCG. Lastly, you have to assemble both halves and secure them with pins. Once you have assembled your AR, with a thumb on the back of the charging handle, unlock the handle pressing a latch with your index finger and cycle the action forcibly several times. The movements that should be in line with the top centerline of the handle, are to check the functioning. As a rule of a thumb, you should avoid at all costs pulling up and twisting the charging handle as you cycle it. The key word in upgrading a charging handle is ergonomics. The charging handle has passed a long way from the first prototypes where it was located under the carrying handle to the rear of the receiver on currently produced AR-10. However, there are some AR fans opting for a side-charging upper to improve their rifle’s chargeability, but side-charging uppers on AR-10’s can be expensive, and they prevent the use of some standard parts. In any case, an adequate aftermarket charging handle that matches the quality of your rifle will improve your shooting experience exponentially, making it an excellent investment for any .308 AR topped with a scope.